In this e-juice review, we’ll be taking a look at The Custard Shoppe, which is a new e-juice line brought to you by Jam Monster Liquids! Jam Monster is an incredibly popular line that offers multiple flavors, but each of them have a “Jam” base. The same can be said about this line of e-liquids, each of them are Custard based. 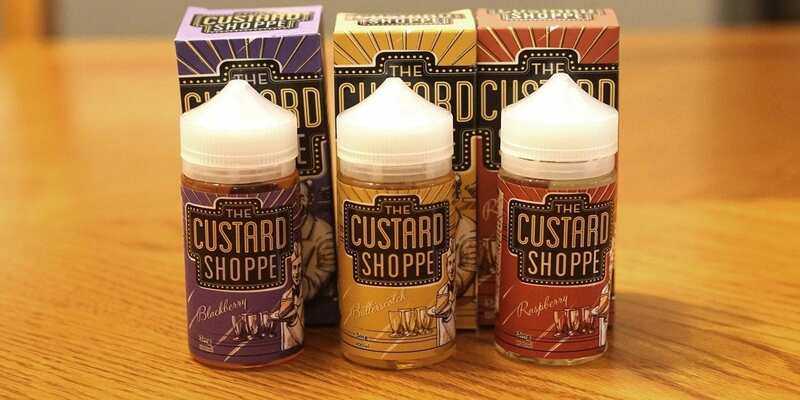 The Custard Shoppe consists of 3 different flavors which are Butterscotch, Blackberry and Raspberry. Each flavor offered comes in a large 100ml Chubby Gorilla bottle, and have a 75VG/25PG blend, which is a great blend for both drippers and tanks! In addition, each flavor is available in 0mg, 3mg and 6mg nicotine strengths. Before getting any further into this e-juice review, we’d like to thank Fuggin Vapor for sending these 3 flavors for the purposes of this review. We will provide you with our overall thoughts about these flavors and let you know whether or not we recommend them! Remember, taste is subjective, so what we may like you may dislike and what you like we may dislike. We will first go over the specific mods and atomizers used to test each of these flavors and then will continue on to the most honest Custard Shoppe review! Click Here to Check Out This E-Juice Line! Some blackberry flavors come off a bit tasting like medicine or even smell that way, this is certainly not the case with The Custard Shoppe Blackberry. This is definitely one of the better blackberry vapes we’ve tried, and maybe even the best when it comes to this type of flavor profile. On the inhale, you get a blackberry custard flavor. On the exhale, you get the same blackberry custard, but in the background there’s pie notes and you taste the same on the tail end of the exhale. This flavor is a bit on the sweet side, but not overwhelming sweet. The throat hit is smooth, and the vapor production is great. I do want to mention that this flavor does vape better at higher wattages as it brings out the custard and pie notes much more than lower wattages. The blackberry flavor is the most dominant, but not by much. The custard comes in right after you exhale, and you can taste the pie note in the background. It really is a tasty vape, and not your ordinary custard, that’s for sure. Overall, Blackberry Custard by The Custard Shoppe is an excellent dessert vape that we can easily consider an all day vape at Vaping Cheap. If you’re a fan of custard and blackberry flavors, then definitely give this one a shot, you won’t be disappointed. Raspberry by The Custard Shoppe is an excellent dessert vape! However, this one is a bit different than the previous flavor reviewed. The raspberry flavor is pretty sweet, and the overall vape experience is a tad bit sweeter than Blackberry. In addition, this flavor is much more dominant in comparison, which is not necessarily a bad thing. On the inhale, you get a sweet raspberry. The raspberry flavor is natural tasting, which is great for this type of flavor profile. On the exhale, you get the same sweet raspberry flavor and it’s blended with custard. The custard flavor is not as noticeable, but you can still taste it for sure. The pie flavor is right at the tail end of the exhale, and it’s something you do have to look for. The throat hit with this one is silky smooth, and the vapor production is solid. Just like the last flavor, this one vapes well at higher wattages as well. Overall, Raspberry Custard by The Custard Shoppe is an incredible dessert vape and is another all day vape for us. Honestly, we do wish the pie and custard notes were just a bit more present throughout the vape experience, but regardless it’s still pretty tasty. If you’re looking for a good raspberry custard vape, then look no further than this one! Butterscotch by The Custard Shoppe is the last flavor to be reviewed in this e-juice line, and is another solid vape! On the inhale, you get a slightly sweet butterscotch flavor. However, on the exhale you get the butterscotch flavor mixed with custard. At the very end of the exhale, you get that pie note. The pie note is definitely something you have to look for in this flavor, more so than the Raspberry. This is on the sweeter side as well, but not overbearingly sweet by any means. It’s just sweet enough to satisfy that sweet tooth! The butterscotch flavor is not on the candy side, which is a first for us, since many butterscotch flavors we’ve tried do give off a candy essence. The throat hit on this flavor is also very smooth, and the vapor production is as you’d expect from a 75VG/25PG blend, which is great! All in all, this is yet again another great e-juice by The Custard Shoppe. This isn’t our favorite of the line, but it’s still pretty close to the other two. If you like butterscotch and dessert flavored e-liquid, then we do recommend trying Butterscotch by The Custard Shoppe! In conclusion, all three flavors from The Custard Shoppe e-juice line are excellent, and two of them are all day vapes for us at Vaping Cheap. Even though the butterscotch is our least favorite, it’s a pretty close 3rd. What we really do like about this e-liquid line is that they choose to do different types of custard vapes rather than the traditional strawberry and vanilla custard. This certainly paid off as all 3 of these flavors are not only unique, but they just vape great. Honestly, we couldn’t choose a favorite between Blackberry and Raspberry. Both of them are incredibly tasty, and are considered all day vapes. If you’re after more of a custard and pie, then go for Blackberry, but if you want more of the fruit note, then the Raspberry will be for you. All in all, Jam Monster Liquids did a great job with this e-juice line, and I’m sure vapers who’ve tried this line would agree. If you were a fan of Jam Monster or looking for some new custard and dessert vapes to try, then we definitely recommend checking out The Custard Shoppe by Jam Monster Liquids.